A firm fixture in the regional calendar, the Midlands & Central Awards lunch is a networking occasion not to be missed. Following three successful sell-out years, we are delighted to announce that this popular event will be moving to the impressive ICC Birmingham in 2019. The world-class conference centre will not only provide the perfect setting for this awards lunch, but also be able to accommodate the ever-increasing demand for tables. Guest will enjoy reception drinks and will then be seated for a 3-course lunch and entertainment from a guest speaker before the announcement of the regional award winners. 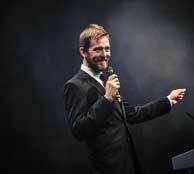 Award-winning stand-up comedian Alun Cochrane can often be seen at the biggest comedy clubs across the country. In 2018, he toured the UK with his tenth solo show ‘Alunish Cochranish’ following its success at the prestigious Edinburgh Fringe Festival. On screen, Alun has starred in Mock the Week and 8 Out of 10 Cats, as well as The Now Show and Just a Minute on BBC Radio 4. He even gave audiences a humorous guide to his family home in mini-series Alun Cochrane’s Fun House for BBC Radio 4 Extra. Every Saturday, Alun co-hosts The Frank Skinner Show on Absolute Radio where listeners can catch highlights of his exceptional storytelling and latest observational quips. Price includes drinks reception and, three course meal, tea & coffee, and Awards Presentation.